- Presented in full Widescreen! After several years of making movies without personal appearances things are about to change. This new release is purely fictional and presents Elvis Presley’s Comeback Special in a totaly different way; Elvis is hosting his own TV Special and tells his side of the story. Elvis talks about his career, first record and Hollywood. Presented in "True” widescreen for the first time! Not stretching out Elvis body or face, but all shots individually prepaired for the best result! The opening is sensational and has a FULL version of Trouble/Guitar Man, including Elvis' footage from the Discotheque, Supper Club,wearing Black leather as well as the original version all edited to perfection! That’s All Right, Trying To Get To You and Tiger Man get the special really started! Most clips have been re-edited for watching pleasure, for example the “break up" version of Heartbreak Hotel (second sit down) has been recreated as a full rockin’ version! Same goes for That’s All Right and Blue Suede Shoes; full versions without repeatable parts, making some portions shorter then usual but it all works quite well for the overall “feel” of this Special. The gospel section also has been re-done including rare alternate footage and performances. All songs have been re-edited. Elvis talks through the whole special and lots of rare footage accompanies him while doing so. We already can hear all the critics...."Why include the boring commercials” .. but it is part of the idea of recreating something in a way as if it is 1968 and this special was shown on tv, inluding commercial breaks. Dont worry.. you can skip them if you like .. but we advise not to do this the first time you watch it. 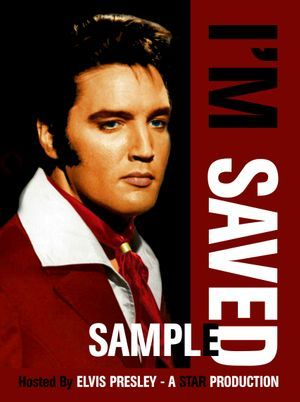 All fans must agree that 1968 “Saved” Elvis' career, so no need to explain why the producers of this dvd called it: “I'M SAVED"
Sit back and relax, and let Elvis take you on a musical journey through his Life. You’ve all heard the stories... Now hear the true ones from the man himself! We’re not saying it is better, but it’s approach could have been at least as good for actual viewing at the time.